On 23rd of December 2018 in Kharkiv will take place Kharkiv Steam Train Tour - holiday train ride with steam locomotive Er-794-12 (made in 1954, Zegelsky Plant, Poznan, Poland) and 3 passenger railway wagons with 158 seats. 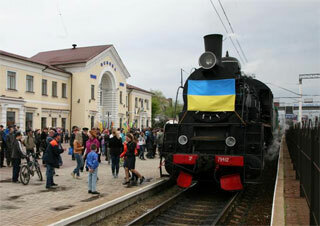 Train №895 / 896 will depart from Kharkiv Main Railway Station at 10:30 and arrive in Lyubotin Station at 11:37. On return trip the train departure from Lubotin at 12:40 and arrive in Kharkiv at 13:35. Tickets for Kharkiv Steam Train Tour can be purchased at all ticket offices that sell tickets for long distances of train service.